We are very pleased that we have been able to secure some extra fishing for members and visitors by opening on Saturday 1st March this season. The reservoir has normally been opened for fishing on the 20th March. Lets hope the rains has stopped by then. An update from Alex (our Returns Secretary): 43 anglers attended our opening day including 6 visitors. It was a very cold and dry morning but fish were rising although tempting them to the various fly patterns was a challenge. However, 63 fish were caught, unfortunately 7 anglers blanked. A few of us that couldn't make it on the opening day, raced against the weather and fished on Sunday morning before the weather closed in. Although overcast and pretty cold, it was a pleasure to be at the reservoir. Stewart Smith caught pretty early off The Tump and then came and joined me just around the corner in the bay where we landed a few more and lost even more! Justin Palmer had tried down the East Bank then ended up landing a fish on the North Bank. We now have boats available on the water - please remember to bring your own life jacket if you plan to take a boat out. 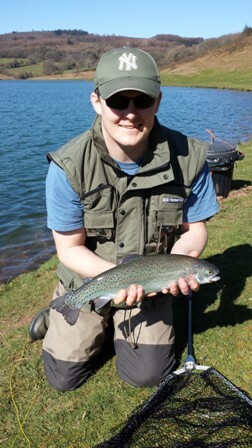 Excellent fishing at the reservoir and regular stocking of quality Rainbows between 2 and 3lb weight continues. The cooler and dry weather has encouraged many anglers to visit the reservoir. 3 at 2lb 12oz and John Hefferman 3 fish 7lb 9oz that included one at 3lb. Wheeler-Newport 2 fish 4lb l5oz and Gary Archer 3 fish 7lb 4oz. Weather prediction for the next few days look favourable for fishing. Membership of the Association is available and applications forms are available from the Secretary. What an excellent day it turned out to be! A westerly breeze was forecast with a reasonable amount of sun, no problem for attacking the hot spots around The Tump. The wind took a while to settle as a Westerly and I don't think I saw a cloud all day! There were people catching from early-on at the far end (North) of The Tump. Mainly on Nymphs and Buzzers. After bagging a few in that area and a well earned tea-break, a wander across the Dam end of the reservoir and a fish down the East Bank was in order. Things weren't so lively to start with but one fish was lost at the North end of the bay past the tower. Things picked up a little just about the Tin Shed area. My Son, Dave was fishing with me and landed a good looking fish on a Gold Head Hares Ear after a leisurely struggle! We moved further into the corner where we stayed with Nymphs and Buzzers and plenty of pulls were evident. Unfortunately, we hit our limit and all good things had to come to an end! This was my last catch on a gold head with red wire and stiff 'V' tail. As we were wrapping up, Chris Daniels wandered around to the North Bank from The Tump and appeared to bag up in record time. Chris was fishing a team of 3 Diawl Bachs (with his incredibly patient retrieve) that he had tied himself and couldn't seem to go wrong. A cracking day was had by all that visited. No need to get out into a boat quite yet it seems. 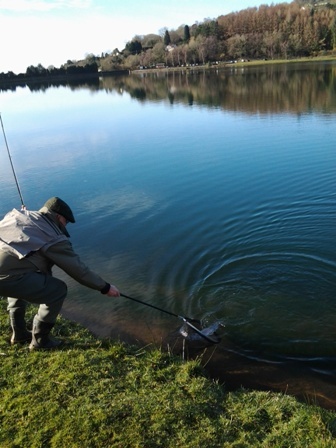 Not many people made it up to the reservoir but those that did caught fish! All fishing took place from the bank and it didn't take too long for fishing to be focussed on and around The Tump again. Jack Wells made a quick visit - just a couple of fish was his target but he couldn't stop himself from taking 3. Visitors Cameron Maison and Sean Pearce were back again after a couple of previously successful visits and both took their bag of 5 fish before lunch! Roger Pike also made a quick visit and quickly had a couple of fish in the bag. Others continued to catch, mostly on small nymphs and buzzers - Diawl Bachs again being successful. A fairly good week, although it was very cold on several days it was not raining most of the week. A further stocking of good quality rainbows during the week ensured that plenty of fish were available although tempting them to artificial flies was sometimes difficult and not always successful. Total catch for the week was 87 Rainbows with the heaviest being 3lb 8oz. Rainbows were caught by Steve Hunt who netted 5 fish totalling 15lb 2oz. Lionel Davies 2 fish - 5lb, Robin Fehler 4 fish - 9lb, Chris Daniels tried several parts of the reservoir and was rewarded with 2 fish. 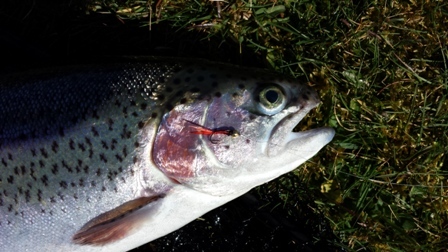 Roger Pike fished an afternoon session netting 2 Rainbows. Chris Daniels on another visit netted 5 fish - 12lb 8oz (2 of which weighed 2lb 12oz). John Lillycrop did not manage to catch a fish but have several break his leader! Boat anglers included Jack Wells 3 fish - 8lb, David Bailey 3 fish, Roger Barnes 4 fish - 11lb 7oz with a best fish of 3lb 5oz. Ken Pascoe 2 fish - 4lb 12oz, Howard Davies 3 fish - 7lb, S. Lax 1 fish - 3lb, Paul Godwin 4 fish - 10lb 8oz. Catch and release anglers included Richard Hallaran - 9 fish, Dave Ellis - 9 fish, M Bradbury released 2 and killed 1. Visitors catching limits included S. Maison - 5 fish - 10lb, S Pearce - 5 fish - 10lb 2oz. Prospects for the next couple of weeks look favourable. New finishing times are displayed at the Lodge. Alex Johannesen - Returns Secretary. A couple of visits to report - I took a boat out for the first time on Friday 4th April and I have to say I had trouble changing from bank to boat! After a bit of a struggle I did catch 1 to release and lost a couple. There were plenty of fish rising and a lot of anglers (including other boat fishermen) were doing well. Many were catching on Diawl Bachs which seem a favourite at the moment but I do know a fellow boat angler took 5 fish on a white Minkie. Nevertheless, it was a beautiful day and thanks to Mat Smith for the tea! (Yes Jack, it was perfectly drinkable)! Sunday 6th April saw me make a late afternoon visit to the reservoir. I didn't hink I would be there too long and probably leave after getting a soaking. It stayed dry unbelievably, although there was quite a wind. I stuck to the bank and made my way to the Tump where I struggled to get a cast out and reverted to a few backward casts. I wandered round the corner to get a bit of shelter but without waders struggled to get a line out - "I know" (I thought), Chris Daniels is further round on the East bank, I will make way to pick up a few tips! Chris had netted a couple of fish and had recently been broken off by a fish that took some backing off his reel a couple of times. There were fish lazily breaking the surface and it was certainly more sheltered. 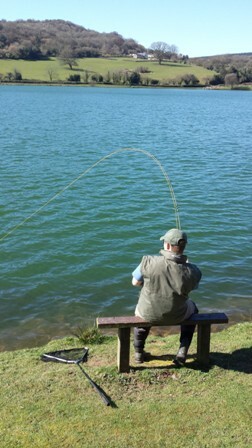 Chris continued to take 5 fish on his home tied Diawl Bachs at some range. For me, most fish were out of range although I did release 2 fish, both good size and in excellent condition. Glad I made the effort. A much improved week with plenty of fish caught from the bank and boats. Another excellent stocking of quality fish during the week. Best fish of the week a 5lb Rainbow caught by R. Bick that was part of his 5 fish haul total weight 17lb 9oz. Visitor Chris Cuff caught one fish which weighed in at 4lb. C. Mathews 3 fish - 8lb 2oz best fish 3lb, Nick Parsons 2 fish - 5lb 4oz, Ian Bennett and D. Potter both caught 2 fish. Eddie Ricci was back in action catching 3 fish 7lb 10oz - best fish 3lb 6oz. David Bailey netted a limit bag of 5 fish - 10lb 3oz but Don Thomas could only manage to catch 3 fish - 8lb 8oz which included 2 fish of 3lb. Hywell Phillips caught his limit of 5 fish - 12lb fairly quickly as did R. Bick with a total weight of 15lb 4oz during his second visit of the week. Chris Cuff on his second visit caught 5 fish totalling 15lb 8oz. Malcolm Reed 4 fish - 9lb 4 oz, Peter Evans 2 fish, John Lloyd 2 fish, Peter Dent 4 fish, Peter Johnson 5 fish - best fish 4lb 4oz. Barry Jones 2 fish including 1 at 3lb. Ian Morrison 5 fish, Les Murphy 3 fish. Visitors T Langley 2 fish, A. Pollard 1 fish weighing 4lb 8oz. Boat anglers included David Jones on his first outing this season landed 1 fish, Jack Wells 3 fish, David Wells 5 fish, A. Ryan 2 fish, P. Thomas 1 fish, C. Joules 5 fish, Peter Edwards 3 fish, Richard Cooper 3 fish, Phil George 4 fish. Catch and release anglers included Richard Hallaran - 1 fish, Nick Parsons - 7 and killed 2, David Russel - 3 and killed 1. Hot spots were the Tump and East Bank areas and any improvement in the weather conditions should provide more excellent fishing. A. Johannesen - Returns Secretary. "I was a little late leaving the pontoon due to a previous boat user concocting all sorts of knots in the anchor rope thereby preventing me to release the boat earlier. As another boat was prowling the east bank I thought I would line the boat up from the centre of the dam and with a gentle breeze drift down the lake.This was at 9.55 a.m. Using my old Shimano Stradic 9ft.6. 7/8 and an inexpensive Crosswater-Redington reel with a RIO Deep 7 type 7 F/Sinker I cast out and let the line go as far as the backing. I had attached a brown dyed squirrel tail (short minkie) white body with red head size 12 to the 6lb tippet. Retrieving the line after my third cast I felt a dull thud and then nothing until the line started off on what was a 20 minute battle to eventually get the fish to the surface. It then took another 5 minutes to net the fish. Regrettably, due to the fly having penetrated the roof of the palate it took so long to remove it that I was forced to despatch this beautiful specimen of a classic Wentwood Brown trout which weighed in at 7lb 2oz." Thank you David, not your every day visit! A disappointing week even though more Rainbows were released into the reservoir. Total catch was lower than the previous week, sunny days and fish were moving into the deeper waters. Mostly bank anglers had a good week especially fishing the Tump area and East bank. Mark Walker 4 fish 8lbs 7ozs, Justin Jones 3 fish 5lb 2ozs, J Lloyd 2 fish 4lb, Mark Ricketts 2 fish 4lb 14ozs, Matt Ricketts 2 fish 4lbs 12ozs, Rhys Ricketts 2 fish 4lbs 11ozs, R Padfield 1 fish 2lb 10ozs, Lionel Davies 3 fish 6lbs 8ozs, Barry Jones 3 fish 3lbs 6ozs, Colin Poole 3 fish 7lbs 9ozs, A Langley 2 fish 4lbs, T Roderick 5 fish 11lbs 10ozs and that included 1 at 4lb and 1 at 3lbs. Heaviest bag of the week taken by D Shankland 12 lbs 1oz two of which weighed 3lbs each. Phill Schroll boat fished netting 5 fish 10lbs 11ozs. Paul Grande on his first boat session netted his first fish of the season at 2lb 10oz, Roger Pike 5 fish 11lb 5oz, D Ford 1 fish 3lb 2oz. On catch and release were M Roberts released 5, P Osborn released 6, M Osborn released 4, L Rumble released 6. Mainlines used were floaters, intermediate and fast sinking coupled with fly patterns including cat’s whiskers, buzzers, red Montana and damsels. Details of the spring competition are displayed in the lodge and official website. A fairly good week although it was very cold on several days at least it was not raining during most of the week. A further stocking of Rainbows during the week ensured that plenty of fish were available but tempting them to take the artificial fly was difficult and not always successful. Total catch for the week was 146 Rainbows and the heaviest was a 3lb 8oz netted by Steve Hunt which was part of his limit bag that comprised 1 at 3lb 4oz, 1 at 3lb 2oz, 1at 2lb 8oz and 1 at 2lb 4oz. Lionel Davies 2 fish 5lb, Les Murphy 2 fish 5lb, Robin Fehler 5 fish 9lb Roger pike fished an afternoon session netting 2 Rainbows weighing 3lb 3oz and 3lb 6oz. Chris Daniels was on top form netting a five limit bag weighing 12lb 8oz 2 of which weighed 2lb 12oz. John Lillycrop fished several previous hot spots but failed to catch a fish. Boat anglers were Jack Wells 3 fish 8lb, David Bailey 3 fish 6lb 4oz, Don Thomas 1 fish 2lb 8oz, David Wells 2 fish 5lb 10oz-best fish 3lb 10oz, Glyn Row 2 fish 4lb 2oz, R Bateman 1 fish 2lb 8oz. Catch and release , Mike Roberts released 20 killed 1 3lb 8oz. Mark Dearman 1 fish 2lb 8oz, Colin Poole 2 fish 4lb 3oz. Other visitors were Les Wilson – Cardiff 2 fish 4lb 5oz, Terry May-Bristol 1 fish 3lb, Mike Wood-Gloucester 3 fish 7lb, Peter Green-Cardiff 1 fish 2lb 10oz and Martin Davies-Newport 2 fish 4lb. Fishing lines used were floating, intermediate, sink tip and slow to medium sinkers. Best flies and lures cat’s whisker, black Montana, viva, black buzzers, gold headed damsels and appetiser. The Association hold their spring competition on Saturday the 17th May. Visitors are welcome but will not take part in the competition. Fishing details are displayed in the lodge. The annual Spring Bank Competition was a fiercely contested one especially as it was a very hot and sunny day. The event was won by Mike Roberts with 6 fish-14lb 8oz who also had the heaviest fish a 3lb 3oz Rainbow. Runner up was Glyn Row with 6 fish 14lb 3oz and in third place was Ann Heming with 6 fish 13lbs 14oz. 18 anglers took part and 66 fish were caught with 2 anglers recording a blank. Most competitors stated that it was the best competition for several seasons despite the hot weather. Apart from the odd day, fishing was extremely productive during the week. Successful bank anglers included Nathan Jones 1 fish 2lb, Steve Jones 4lb 7oz, John Hefferman 3 fish 7lbs, Chris Day 2 fish 4lb, T Langley 5 fish 12lb 12oz, R Bateman 2 fish 4lb 12oz, Bernard Price 5 fish 11lb 9oz, Des Bull 5 fish 11lb 9oz, M Williams 2 fish 6lb 6oz best fish 3lb 12oz, Colin Poole 5 fish 12lb 5oz that comprised 1 fish 3lb 5oz and 4 fish each weighing 2lb 8oz, Derek Elson 3 fish 6lb 6oz, Eddie Ricci 2 fish 4lb 2oz, John Higgins 4lb 14oz, D Shankland 5 fish 10lb 12oz, G Williams 2 fish 4lb, Dave Costin 3 fish 7lb 4oz best fish 3lb. Boat anglers also had very successful days and included Ann Heming 5 fish 12lb 8oz, Tony Heming 5 fish 11lb 7oz, John Lillycrop 5 fish 14lb 10oz best fish 3lb 3oz, Roger Barnes 4 fish 11lb 7oz, P Pritchard 4 fish 9lb 2oz, Bob Peake 4 fish 8lb 6oz, Dave Jones 2 fish 5lb, Howard Davies 1 fish 2lb 12oz, Malcolm Reed 5 fish 12lb 8oz, RJ Roberts 5 fish 11lb 12oz. David Bailey 5 fish 10lb 12oz, Don Thomas 3 fish 7lb, Peter Shroll 3 fish 7lb. Fishing catch and release were M Roberts released 20, Ken Pascoe released 7. The tump and North bank continued to be the hot spots but fish were caught in various spots on the East bank. Anglers used floating sink tip and intermediate lines and fast sinking lines as and when necessary. Top lies and lures were red and black Montana, cat’s whisker, damsels, black buzzers and green fritz’s. Providing there will be no major changes to the weather conditions fishing prospects should be productive. More fish were released into the reservoir but fishing prospects were spoilt by the dreadful weather conditions at the start of the week and at the end but conditions were ideal during the middle of the week. The annual spring competition attracted eighteen competitors and the event was won by Mike Roberts with 6 fish 14lb 8oz that included the heaviest fish that weighed 3lb 3oz. In second place was Glyn Row with 6 fish 14lb 3oz and third was Ann Hemming with 6 fish 13lbd 14oz. Only two anglers failed to catch a fish. During the week anglers fishing from the bank were fairly successful and included Colin Poole 5 fish 11lb 8oz, Don Thomas 5 fish 12lb 8oz, David Bailey 5 fish 11lb 4oz, Randall Bick 4 fish 11lb that included 1 fish 3lb 6oz, and another at 3lb, S Shaw 3 fish 6lb 10oz, Dave Costin 1fish 2lb 3oz, R Waters 1 fish 2lb 6oz, Des Bull 2 fish 4lb 10oz, C Cole 4 fish 9lb that comprised 1 at 3lb and 3 at 2lb, LW Kelly 1 fish 2lb 8oz, Chris Daniels a regular at the reservoir managed to hook a single fish 2lb 12oz. Justin Jones 2 fish 3lb 15oz, R J Berry 2 fish 4lb 2oz, G Morris 1 fish 2lb, C Earnshaw 1 fish 2lb 2oz and P Bowes 1 fish 3lb. Boat anglers include Malcolm Reed 3 fish 10lb, 1 weighed 3lb 12oz, another weighed 3lb 4oz and the 3rd was 3lb. Boat partner netted 2 fish 4lb 6oz, Mike Davies 3 fish 7lb 1oz, best fish 3lb 4oz, M Lewis 5 fish 10lb 8oz, Howard Davies 5fish 11lb 10oz, Ken Pascoe 4 fish 9lb 3oz. Lines used were floating , intermediate, fast sinkers and sink tip and the usual assortment of flies and lures, damsel, cat’s whiskers, blood worm, Montanna, orange gold head and black buzzers. Revised fishing times are displayed in the lodge. A week of mixed fortunes for bank and boat anglers. Plenty of fish are moving just below the surface but as soon as the temperature rises the fish move into the deep water near the tower and east bank area. Derek Elson had an evening session fishing from the bank netting 5 fish 11lb 1oz, as did Tim Bennett with 2 fish 5lb 10oz, Eddie Ricci 1 fish 2lb 2oz, A Badham 2 fish 4lb 4oz, L Davies 1 fish 2lb 5oz, P Newman 4 fish 7lb, J Leslie 1fish 3lb, A Sangster 2 fish 4lb 4oz, E McGuinness 2 fish 5lb, Tim Williams 2 fish 5lb best fish 3lb, Stuart Todd 2 fish 5lb, G Martins 2 fish 4lb 10pz, P Grundy 2 fish 4lb 12oz, Gill Sellars 2 fish 4lb 12oz, Eddie Ricci on a second visit caught 5 fish 8lb 10oz, Alan Knight 1 fish 2lb 8oz, D Shankland 5 fish 12lb, R Bick 2 fish 5lb including 1 at 3lb, Rick Howell 5 fish 12lb 7oz best fish 3lb 2oz, Colin Poole 5 fish 10lb 4oz, Peter Weston 3 fish 6lb, T Roderick 2fish 4lb 14oz, M Reed 2 fish 4lb 14oz and K Padfield 2 fish 4lb. Moderate successes fishing from the boats were Mike Davies 3 fish 7lb, Bob Stoodley 3 fish 7lb, Roy Lane 3 fish 7lb, Paul Pritchard 3 fish 6lb 11oz, Jack Wells 3 fish 7lb 4oz, David Wells 3 fish 7lb 2oz, David Jones 2 fish best fish 3lb 12oz, R J Roberts 3 fish 7lb, M Evans 5 fish 12lb, R Evans 5 fish 12lb 8oz, Les Murphy 2 fish 4lb 8oz, Roger Barnes 3 fish 7lb, Dave Costin 1 fish 2lb 10oz, David Bailey and Don Thomas each caught 2 fish with a bag weight 4lb 12oz, Tony Heming 4 fish 10lb 4oz, Ann Heming 5 fish 8lb 15oz, Peter Dent 5 fish 12lb 4oz best fish were 2 at 3lb, Vic Duke 3 fish 7lb 2oz, Howard Davies 3 fish 7lb 2oz. Malcolm Reed on another visit caught 5 fish 13lb 6oz that included 1 fish 3lb 12oz and another at 3lb 8oz, Richard Hallaran 5 fish 10lb 8oz, Peter Evans 3 fish 7lb 10oz and Dave Ellis 1 fish 2lb. Visitors G O’Toole 5 fish 12lb 10oz and M Wood 5 fish 12lb. The west bank near the pontoon and east bank towards the tower are again the hot spots. Best methods are to use floating and slow intermediate lines coupled with buzzers, diawl bach, Montana and damsel nymphs. A disappointing week for boat and bank anglers during the week, although the prospects for catching fish did improve during the last couple of days. 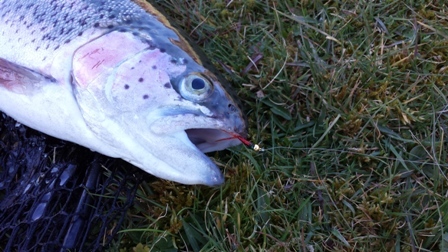 The recent cooler weather resulted in a good evening hatch of insects which has resulted in some fantastic quality and hard fighting trout being caught to dries and sub-surface patterns. The hot weather during the day continues making the fishing challenging, with the best chance of success being to fish from a boat using a sinking lie. Fishing from the boat included Mike Woodcock 1 fish 2lbs 4oz, Les Shirley 4 fish 9lb 12oz, Mike Wood from Bristol 4 fish 10lb 3oz, G O’Toole also from Bristol 5 fish 11lb 4oz, D Pritchard 2 fish 3lb 12oz, Dave Jones 1 fish 2lb 6oz, RJ Roberts 2 fish 5lb, Les Murphy 2 fish 5lb, Mark Edwards 1 fish 2lb, Gareth Morgan 1 fish 2lb, Steve Hunt 2 fish 4lb 12oz, Peter Dent 2 fish 3lb 14oz, Howard Davies 3 fish 6lb 3oz, Ken Pascoe 5 fish 11lb 6oz, best fish 3lb, D Poyner 3 fish 7lb, best fish 3lb and on a second visit Les Murphy another 2 fish 4lb. Bank anglers that caught fish were Andy Graham 1 fish 3lb, P Tovey 2 fish 4lb, Derek Elson 4 fish 9lb 4oz caught from a late afternoon session, on a second visit caught 5 fish 11lb 14oz, John Edwards 2 fish 3lb 11oz, J Lloyd 1 fish 2lb 8oz, Eddie Ricci 3 fish 6lb 14oz, Don Thomas 1 fish 2lb 8oz. Catch and release anglers included Alan Shearn released 2, Howard Davies released 2, Peter Dent released 2, Nick Parsons released 7 killed 2, Dave Rosser released 6 killed 2, F Parsons released 2 killed 1, Matt Smith released 2. The tump area past the pontoon and East Bank area towards the tower continue to be productive, top flies included bloodworm, cats whisker, damsel buzzers, diawl bach and pheasant tail nymphs. Eight boats are available for hire but life preservers are not available for hire. Although there were variations in weather conditions during the week many anglers were reluctant to go fishing. The reservoir was again stocked with quality fighting fish. Most anglers reporting on their stamina and hard-fighting attributes. Visitor G Neale took 3 fish 6lb 8oz, J Burton 1 fish 3lb, Les Murphy 2 fish 4lb 6oz, RJ Roberts 3 fish 7lb, Steve Hunt 1 fish 1lb 12oz, Mike Davies 2 fish 4lb 3oz, Colin Poole 4 fish 8lb, S Grattan 3 fish 8lb, best fish 3lb 8oz. R Grattan 2 fish 4lb 3oz, best fish 2lb 11oz, L Light 2 fish 4lb 8oz. 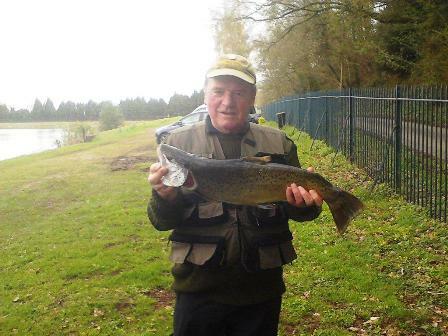 On a second visit Les Murphy caught 1 fish 3lb 6oz and brother Arthur Murphy netted 2 fish 4lb. John Lillycrop struggled during an afternoon boat session but landed 2 fish 4lb 5oz and Roy Lane caught 1 fish 2lb 8oz. Bank anglers did manage to catch a fish or two but fish were reluctant to take the fly. Dow Thomas 1 fish 2lb 8oz, David Bailey 1 fish 2lb. Eddie Ricci 1 fish 2lb. Other boat successes included Mike Roberts 5 fish 9lb 10oz, Phil Shroll 5 fish 11lb 5oz, Ann Heming 5 fish 11lb 11oz, Tony Heming 5 fish 9lb 14oz. Catch and release anglers included Alan Shearn 2 fish released, Ken Pascoe released 1 fish, Richard Hallaran released 1 fish, P Wyles released 2 fish and Mike Roberts on a second visit released 6 fish. Fish will move into the deeper water especially near tower bay and the east bank. Anglers will be using sinking lines and various flies and lures but fish will be rising during late afternoons so try a floating line with buzzers, blood worm and damsel nymph or even a sedge pattern. A very difficult and disappointing week for both boat and bank anglers. A further stocking of quality fighting fish found many anglers struggling to record a catch despite fish moving around the edges of the bank. Many boat anglers used high rated Di lines hoping to catch the odd fish searching for food in the deeper water of the reservoir. Those boat anglers who were successful included Peter Dent with 3 fish -6lb 15oz using suspended diawl bachs on a floating line, P.Pritchard also caught 3 fish -7lb 2oz best fish was 2lb 12oz, Gareth Edwards several areas around the reservoir and was rewarded for his efforts with 1 fish-2lb 6oz ,R.J.Roberts had several “takes” but only managed to hook 1 fish-1lb 14oz, Les Murphy netted 1 fish 2lb 2oz, former association secretary Dave Jones caught 1 fish 2lb but as he said it gave a tremendous fight that he thought it was going to weigh at least 3lb plus. Jack Wells also caught 1 fish 2lb but former treasurer George Phillips on his first outing for several weeks failed to catch a fish, Howard Davies landed 3 fish 6lb 7oz but regular boat partner Ken Pascoe failed to register a catch. Peter Williams 2 fish 4lb 8oz, Richard Watkins from Bristol 3 fish 6lb 12oz, Howard Davies and Peter Green from Cardiff each caught 2 fish 4lb 3oz. Bank anglers included John Hefferman 1 fish1lb 10oz and on a second visit caught 1 fish 2lb, A.Armstrong 1 fish 2lb. Fishing catch and release were F.Parsons 1 killed 1 released, N.Parsons 1 killed 3 released and Richard Hallaran released 2 none killed. Should this hot weather continue fishing will be difficult. Water level has started drop and there are weed patches in several parts of the reservoir. A brilliant week for the association. Catches were lower than in previous weeks but this was more than compensated by the 12lb 4oz Rainbow caught by member Bob Stoodley and witnessed by Roy Lane during a morning boat session. This fish was in excellent condition and several anglers at first thought it was a salmon. The association believe that there are several more large fish still in the reservoir as previous anglers have reported severe “takes” in the past but the fish either snapped the line or “spat” the hook out to fight another day. Many anglers failed to connect to a fish and the current high water temperature has resulted in the fish moving to the deeper water in the reservoir. A further stocking failed to have any impact on the resident fish even though early rises were seen and fish have been cruising the shallows near the water’s edge. The water is very clear although patches of weed have been noticed in various parts of the reservoir. 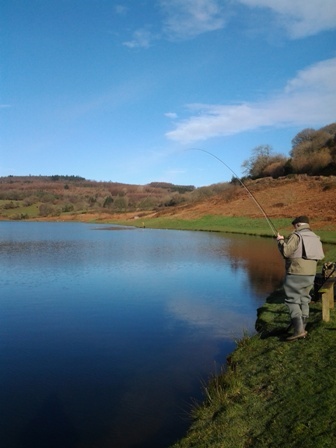 Catches taken by the boat anglers included A. daniels 1 fish 2lb, Les Murphy 1 fish 2lb 8oz, M. Greenway 1 fish 2lb 8oz and on a second visit 1 fish 2lb 12oz, Mike Griffiths-Bristol 1 fish 3lb, Ralph Thomas –Gloucester 2 fish-4lb 12oz, Peter Thomas –Pontypool 2 fish-5lb 4oz, Kevin Thomas-Cardiff 3 fish-6lb 7oz. Several anglers who normally fish the North bank or Tump area failed to hook a fish and eventually moved to east bank which also proved to be difficult but at least they managed to hook several fish but failed to land any as one angler commented “it has been a very frustrating session” however boat anglers did manage and succeed in catching and netting fish including Les Shirley 1 fish-2lb 10z, R. Cooper 2 fish-4lb 15oz, M. Woodcock 2 fish-3lb 12oz, Colin Poole 2 fish-4lb 2oz, Ken Pascoe 1 fish-2lb 8oz, Bob Peake 1 fish3lb 2oz, Tony Heming 3 fish-5lb 15oz, Ann Heming 5 fish-10lb 5oz, David Wells 2 fish-5lb 2oz best fish 3lb, M. Roberts fished several areas of the reservoir and netted 5 fish-9lb 11oz as did R. Bateman who landed 3 fish-6lb 12oz all were taken on a sink tip line with buzzers, Phill Schroll fished an afternoon boat session netting 5 fish-10lb 12ozb but Ken Pascoe fishing with h-d line failed to hook a fish as did regular boat companion Howard Davies. Matt Smith enjoyed an early morning boat session netting 2 fish-4lb 12oz best fish 3lb, while Stuart Smith managed to hook and land 1 fish-2lb 4oz. R. Bateman on another visit landed 1 fish-3lb 8oz, R. Elms 2 fish-4lb 12oz, Jack Wells 3 fish-6lb 10oz ken thomas 1 fish 2lb. during a second visit ken pascoe netted 2 fish-4lb 5oz, Howard Davies 2 fish-4lb 1oz, Roy Lane 3 fish-7lb 4oz. Entry forms for the associations autumn boat competition are in the Cabin and revised fishing times are displayed in the lodge. Congratulations to Bob Stoodley for landing the 12lb 4oz Rainbow. 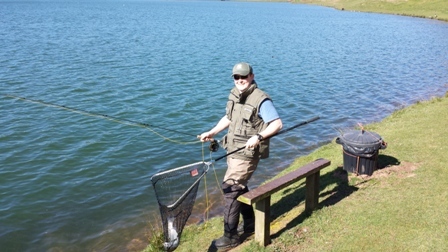 The continuing hot weather has made fishing extremely difficult resulting in many anglers failing to tackle up or perhaps instead preferring to watch the sporting activities at home. The current stocking level continues despite the low catch rate so that when the cooler weather conditions return fishing should be very productive. Fish are well down in the deeper water and it is the boat anglers who have the best sport although tempting the fish to the fly or lure entails a period of extreme patience. Lionel Davies had a late afternoon session fishing from the North bank and was rewarded with 5 fish 10lb 2oz, Jeff Morgan 1 fish 2lb, Steve Bailey 2 fish 4lb, Peter Edwards 3 fish 5lb 12oz, Phillip Jones 2 fish 3lb 14oz, Roger Cook 2 fish 3lb 10oz, Brian Davies 1 fish 2lb. Regular boat anglers included Ken Pascoe 3 fish 6lb 7oz, Howard Davies 2 fish 4lb 8oz, Ann Hemming 5 fish 11lb 3oz-best fish was 2lb 12oz, Tony Hemming 2 fish 4lb 5oz, David Wells 1 fish 3lb 8oz, M Wood from Bristol 2 fish 4lb, Richard Cooper 1 fish 2lb 14oz, Chris Young-Hanham 3 fish 5lb 13oz, Glyn Moore 2 fish 4lb 3oz, Peter Edwards 1 fish 2lb. Top flies and lures were appetiser, Montana, bloodworm and black buzzers. Water still very clear and there are weed patches in parts of the reservoir. Please note revised fishing times are displayed in the lodge. Another frustrating week for anglers. Water continues to be warm and fish are well down in the cooler and the deeper water of the reservoir. Water is very clear but patches of weed can be seen in various parts of the reservoir that may cause problems when trying to land a fish. Boat fishing has been the norm because of the continuing hot weather although this slowed up since many anglers are on holidays. However those anglers who did decide to fish had plenty of sport. Fish were seen to be rising but fish were mainly caught on sinking lines with various patterns of lures and flies. Julian Lynch netted 1 fish-2lb 8oz, David Bailey 1 fish-2lb, Les Murphy 1 fish-2lb, Peter Dent 3 fish-6lb 8oz all fell to a dry fly, Peter Shroll- 2 fish-3lb 8oz, Jack Wells 1 fish 2lb 8oz,R.J.Roberts 2 fish-3lb 8oz, Howard Davies 2 fish -5lb 8oz best fish 3lb,M.Woodcock 2 fish-4lb 7oz, Les Shirley 2 fish-5lb 7oz best fish 3lb 6oz, Ken Pascoe failed to connect to a fish and Arthur Murphy 1 fish-2lb. Bank anglers included Lionel Davies 1 fish-2lb, Nigel Jones 1 fish-3lb, Randle Bick 2 fish-5lb 10oz best fish 3lb, Phil Thomas 2 fish 4lb, Hugh Thomas 3 fish-5lb 4oz, Dave Woodfield 3 fish-5lb 7oz, Peter Edwards Cardiff 2 fish-4lb 6oz, Mike Jones Newport 2 fish-4lb 9oz and Dave Watson 3 fish-6lb 3oz. Best flies/lures were bloodworm, damsels, cats whisker, red buzzers and black and green Montana. Revised fishing times are displayed in the lodge. All anglers please note that the revised fishing times are displayed in the lodge. The reservoir gates will open at 8.00am and will be locked at 9.00pm. Anglers are respectfully advised to leave the reservoir by 8.45pm. Please observe the closing time as stated in the lodge. netting 4 fish-11lb 14oz which included a fine 5lb Rainbow. Steve Hunt 2 fish-3lb 12oz, John Lillycrop 1 fish-2lb 2oz, Arthur Murphy- 2 fish 4lb and Len Murphy 1 fish-2lb 2oz. Howard Davies 3 fish-5lb 10oz, Ken Pascoe 1 fish-3lb, Michael Reed 2 fish-4lb 10oz, Nick Sattin 5 fish-10lb 11oz, Peter Evans 1 fish-2lb 6oz, Peter Edwards 2 fish-3lb 15oz, Dave Roberts 4 fish-7lb 12oz, Terry Griffiths 3 fish-6lb 3oz, Jeff Carter 3 fish-6lb 7oz, Paul Jenkins 2 fish-4lb 12oz. Very few fish were caught by bank anglers but Randall Bick did catch 2 fish-5lb 10oz best fish 3lb, J.McPherson 1 fish-2lb 4oz and L.Williams 1 fish-2lb 5oz. Best flies and lures were Bloodworm, green damsel, cats whisker gold head buzzers. Hot spots were the tump and east bank especially towards the Tower. Again anglers are reminded to take notice of the change in fishing times. A vastly much improved week of fishing prospects for both boat and bank anglers. There were a couple of days where fishing was very unproductive but thanks to the drop in the water temperature fish were feeding mainly in the deeper water but also just below the surface. Boat anglers included Ann Heming netting 5 fish 12lb 3oz heaviest weighed 3lb 8oz during a morning session which lasted 2 hours but husband tony struggled to catch 3 fish-6lb 3oz. John Lillycrop found form during an afternoon session netting 2 fish-4lb 3oz, Alan Shearn 3 fish-6lb 3oz, H.Davies 1 fish 3lb, P.Bradney 2 fish-4lb, Bob Peake 1 fish 3lb, Bristol anglers P.Newman 3 fish-5lb 4oz, G.O,Toole 2 fish-3lb 12oz, R.J.Roberts 3 fish-6lb 8oz, Mike Davies 4 fish-9lb 8oz, W.Pritchard 5 fish-9lb 8oz, David Bailey 4 fish-8lb 15oz, Steve Hunt 4 fish-10lb 4oz best fish 3lb 4oz, Les Shirley 5 fish-13lb 1oz best fish 3lb 1oz, M.Woodcock 2 fish-5lb 5oz, best fish 3lb. Fishing catch and release were Dave Ellis-releasd 8 and killed 2, G.williams 7 released 2 killed, Howard Davies released 2 none killed, Alan Shearn 5 released none killed, and on a further visit Howard Davies caught 3 fish and all were released, Mike Roberts released 16 nad killed none. Fishing from the bank were A.Chambers 3 fish-8lb 4oz, Justin Jones 1 fish-1lb 12oz, K.Padfield 1 fish-2lb 3oz, Mike Brooks 1 fish-1lb 12oz, Vic Duke 1 fish-4lb 12oz,Mike Wood 2 fish-3lb 4oz, Derek Elson 3 fish-5lb 10oz, Lionel Davies 3 fish-5lb 10oz, T.Roderick 2 fish-4lb , D.Shankland 2 fish-3lb 12oz, J.Lloyd 4 fish-8lb 8oz, Randall Bick 2 fish-4lb 12oz, B.Jones-1fish-2lb 8oz, D.Howells 2 fish-5lb 4oz, Dennis Smith 3 fish-5lb 14oz, Terry Watkins 2 fish-4lb, Dave Edwards 4 Fish-9lb, and Richard Jenkins 3 fish-6lb 5oz. and intermediate lines fished with a slow retrieve. Hot spots were the east bank, tower bay and the tump near the pontoon. Anglers please note there remains patches of weed in the reservoir. The prospects for the next couple of weeks should be very good as the water temperature is dropping fish are actively seeking food. and Les Murphy2 fish- 4lb, normally a bank angler Derek Elson decided to boat fish and caught 3 fish-6lb 4oz as did R.Williams and netted 3 fish-7lb, Mike Batt 5 fish-10lb 12oz, Chris Smith 5 fish-11lb 12oz, Peter Evans 5 fish-10lb 4oz, Glyn Row 4 fish-10lb 3oz, David Giles 3 fish-6lb, Keith Thomas 2 fish 4lb 5oz, Bill Jenkins 4 fish-9lb7oz, and Colin Williams 3 fish-6lb 8oz. Fishing from the bank were David Bailey with 5 fish-12lb 6oz best fish-3lb 8oz, Lionel Davies 2 fish-4lb 2oz,Sam Roderick 1 fish-2lb 1oz, Tony Roderick 2 fish-4lb 8oz, D.Shankland 5 fish-11lb 10oz, Robin Fehler 1 fish-2lb 8oz, Matt Smith 3 fish-5lb 14oz, J.Lloyd 2 fish-4lb, Julian Jones 4 fish- 8lb, Martin Edwards 3 fish-6lb 14oz, Steve Williams 2 fish-4lb 12oz. Fishing catch and release were Chris Daniels released 8 killed 1, and released 4 more on another visit, Chris Davies released 4 and Alan Shearn released 7, Howard Davies released 3, Alan Briscoe released 2, Mike Roberts released 13, K.Masters released 7. Hot spots were the east bank and tower bay, tump area and the pontoon area opposite the tin shed on the east bank and the north bank between the weed patches. top flies and nymphs were sedge patterns, hares ear, cats whisker, damsels, black buzzers, diawl bach, green olives, Black Klink Hammers, Orange fritzs and the montana using floating ,sink tip and fast sinking lines all fished with a very slow retrieve. Anglers please note revised finishing time as displayed in the lodge. and killed 1, R.Bateman released 3. The water continues to be clear. More stock fish will be put in during the week. The hot spots were again the tump and east bank and top flies /lures cat,s whisker, montana,black buzzers, damsel gold heads, diawl bach. The reservoir will be closed on Saturday 29th September for the association Autumn bank competition as detailed on the notice board in the lodge. conditions with the cold early morning being replaced with a warmer climate. 4 fish-6 fish 7oz. Bank anglers were D.Shankland 1 fish-2lb, John Higgins 1 fish-2lb 10oz, S.thomas 2 fish 4lb, Tony Roderick 1 fish 2lb 4oz, Robin Fewhler - 1 fish-1lb 14oz, Nick Morgan 2 fish 4lb, B.Price 1 fish 2lb -Matt Smith 2-fish-4lb 6oz, Stewart Smith 2 fish-3lb 12oz. Fishing Catch and Release were Alan Shearn released 1and on another visit released 4 and killed 1, Ken Pascoe released 7. The east bank was the hot spot during the week as was the far side of the tump past the pontoon. Still plenty of weed around the reservoir especially the waters edge. Top flies and lures were the bloodworm, damsel nymph, red montana, black buzzers cat’s whisker, gold heads in orange and green patterns and the diawl bach. Fishing potential should be good for forth coming week.